The Cinque Terre are remote villages connected by a narrow and winding provincial road. 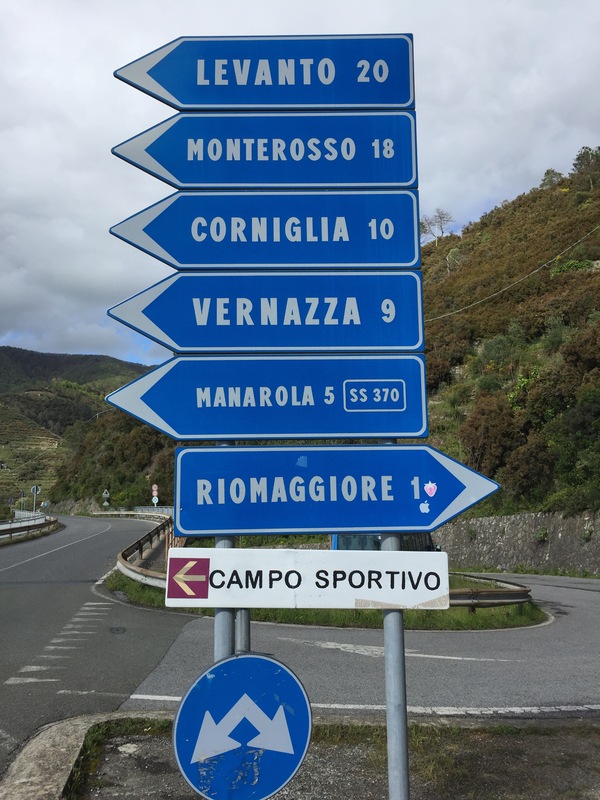 While the villages are easiest to reach by train (which is why I recommend booking a parking space beneath La Spezia Centrale and taking the train just a few minutes to reach the Cinque Terre), some visitors decide to try their luck and actually drive to the villages. Do I recommend it? Meh. I understand the appeal of having your vehicle nearby but honestly it’s a lot of hassle. If you’re up for the challenge, keep reading below. Riomaggiore is the first village of the Cinque Terre that you will encounter if you are arriving from the direction of La Spezia. Each village has payment parking options and these parking spaces will be located closest to the historic centers but not within them (don’t forget that the Cinque Terre villages are pedestrian-only). For details on Riomaggiore’s payment parking situation check out my previous post here. As it is not possible to book a payment parking space in advance, keep in mind that you could very well find the garage full (as the number of spaces is extremely limited, not to mention expensive!). If you don’t mind the inconvenience of hoofing it, you can actually park for free (up to 1km from the village) and save yourself quite a bit of cash. However, keep in mind that the number of free spaces is also quite limited (unless you park even further away on the Litoranea). BEWARE: If you park improperly you risk an expensive ticket, which pretty much defeats the purpose. After turning off the Litoranea (SP- 370) you’ll find yourself on a narrow and winding road without a median line (but don’t be fooled, this is a road with traffic traveling in both directions so stay to the right). PSA: This road has stunning and panoramic views. However, this does not mean you should stop on the road to snap photos or admire the view. Park in one of the free parking places I mention in this post and then go take your pictures! Almost immediately after the turnoff you will see a few places alongside the road where you can park for free (without a time limit). Be sure not to park in the yellow-lined spaces as those are reserved exclusively for local transport. At the T in the road, you will need to head downhill. Just around the bend, you’ll see space on the shoulder of the road where you can park for free (with no time limit). However, if you park here it’s really important that you are off of the road (otherwise you’ll be ticketed). After passing these spaces, continue down the road towards Riomaggiore. You will soon encounter a hairpin turn; proceed with caution. Continuing down the road towards Riomaggiore, you will come to a point where the road widens and you will see parking spaces lined in yellow on the right. As a point of reference, these spaces are beneath an above-ground cemetery which will also be on your right. These are the parking spaces beneath the cemetery, although this is a photo from last year when the lines were white (they are now yellow). You can park for free in the first five spaces you encounter, but with limitiations (keep reading below for more details). The first five spaces you encounter are free parking spaces but have a two hour limit. This means you’ll have to use the disco orario (parking disc) on your windshield to indicate what time you parked there. The local police check these parking spaces frequently (and ticket continuously) so be sure that a) you put the correct time on the disco orario, and b) that you return within 2 hours to retrieve your car. Between 6pm and 8am there’s no time limit on these spaces (but the local police very punctually start checking cars and writing tickets at 8am so beware). The picture above is a “disco orario” (parking disc), which you should find stuck to the windshield of your car. In the event that you do not have one, write your time of arrival on a piece of paper and leave it on your dashboard in clear view. If you continue driving down the hill you will end up at the roundabout at the top of the village of Riomaggiore. There are no free parking options here (but you will find the payment parking garage, which costs €35 per day, downhill from the roundabout). If you do not want to park in the payment parking, this is where you will need to turn around and head back up the road that you just came down on. Do not park in the yellow-lined spaces near the roundabout and do not enter the gated areas as this is restricted traffic zone (ZTL) with parking reserved for residents. The fine for parking in the ZTL without a resident pass is a whopping €122 and supposedly this year they are going to start fining for simply entering these areas without the proper authorization. This area is notorious for issuing lots and lots of parking citations. Follow my directions to a T to avoid a costly fine. Staying in Riomaggiore? Ask your hotel or host if they have parking available for guests (if they do offer parking, expect to pay anywhere from €10-15 per day for it). 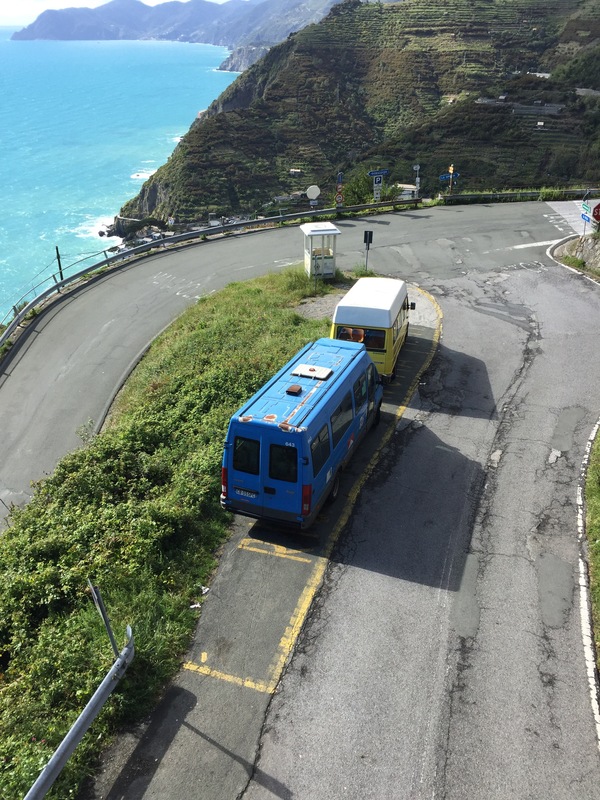 If you are staying in Riomaggiore but you’d like to park in one of the free parking spaces, I recommend first driving down to the roundabout to unload luggage (leave one passenger there with the bags) before returning up the hill to park. During busy periods when the payment parking garage is full you will find a police officer at the turnoff for Riomaggiore directing traffic away from the village. Unless you are staying in Riomaggiore and have reserved a parking space with your hotel or host you will not be permitted to continue down the road to the village. In this case, you will have to park alongside the Litoranea (so even further from the village). For those that don’t mind paying for the convenience, there’s the possibility to hire a NCC (a van with driver, much like a taxi) to come pick you and your things up and shuttle you down to the village. You’ll need to have a phone so that you can ring them, expect to pay €15 for up to 4 people. Contact Luciana or Marzio at 5Terre Transfer at +39 339 130 1183 or +39 340 356 5268. Otherwise, you can pick up one of the buses as it passes by (the Explora bus fee would be €5 per person but there’s not a lot of space for wieldy luggage). Thank you for the wonderful insight you provide on the Cinque Terre. It has been most helpful. We plan to visit the CT on Saturday, May 13. We will drive over to La Spezia from Lucca, park at the La Spezia Stazione Centrale, and take the Explora5Terre bus from there. I have made reservations for the bus. There will be four of us. My wife and I visited the CT in 2002, this will be the first time for our friends. The Explora bus seems like a great option. Thanks again, Joe K.
My pleasure, Joe! I’m sure you’ll have a lovely time. In winter it’s ok. DO NOT TRY in summer. Even in April you wouldn’t find a free space. Leave your car in La Spezia. I also recommend parking the car in La Spezia and taking the train (or Explora bus) to the Cinque Terre. However, I received numerous requests about the free parking situation in Riomaggiore which prompted this post. I’m so happy to hear your positive feedback. 🙂 Grazie mille! I’m planning on visiting at the end of March and hoping to find a free parking spot. This blog was very helpful, thank you! One question…if I am lucky enough to secure a free parking spot do I need to walk along the road to get to the town or is there a path/trail off the road that will get me there? I’ve just updated this post with new info and photos for 2018. If you’re planning to drive to Riomaggiore this year you’ll want to have a look!